Only 2 weeks away from the race!! Training has been steady, if not particularly intense. I will be fine on race day, and am looking forward to being back on my favorite course. 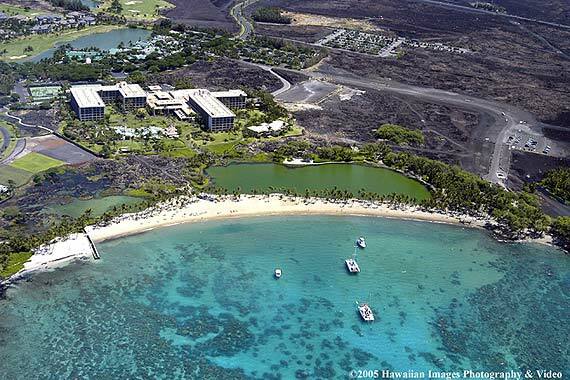 I wanted to share with you a couple images of Anaeho'omalu Beach, where the race will kick off on March 31. 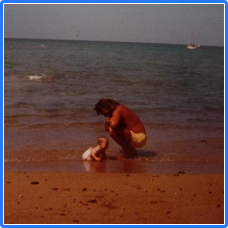 The first image is of me and my father at A Bay (as we call it - who wants to say Anaeho'omalu every time?!) in late 1977. There was nothing there. Just sand, beautiful water, and maybe a boat or two. The second image is what A Bay looks like these days. While you can't see much of A Bay in the first photo, you can just tell it was more deserted than it is now, can't you? The photo was taken after my dad's mom, Lurline - from whom I get my middle name - died of leukemia. We never learned what kind. My dad adored his mother, and her passing was incredibly hard on him. He spoke of her often, and she became my first connection to leukemia and the mission to find a cure. Since becoming involved with LLS and Team in Training, however, I have made so many more connections to the mission, and have an even greater resolve to find treatments and ultimately a cure to all blood cancers. On March 31, I get to demonstrate that commitment again. I'll have Lurline's name written on my arm, along with the names of others I know. I also write the names of those people important to my donors. Please share your connection to cancer, and I'll write their name on me to honor them on race day. Mahalo nui loa for your support, and go with aloha. I've created a countdown clock to keep me accountable for the start to Lavaman! Follow along with me by clicking here. Another Triathlon to Beat Cancer! I'm entering my 10th year of volunteering with Team in Training, benefitting the Leukemia and Lymphoma Society!! It's hard to believe that I went from the consummate couch potato to an endurance hiker, marathoner, and triathlete. You have helped raise over $35,000 during that time, money which has funded treatments that save lives every day. Treatments like immunotherapies that use a person’s own immune system to kill cancer. You may not know it, but every single donation helps save a life with breakthrough therapies and research. The monies you have generously donated have led to breakthroughs not just for blood cancers, but for cancers across the spectrum. If you or someone you know has battled any kind of cancer, the Leukemia and Lymphoma Society has helped in their fight. Please make a donation in support of my efforts with Team In Training and help get us all closer to a world without blood cancers, without any cancer. Thank you, and GO TEAM! "Laura best wishes on your endeavor!!!!!! You ROCK!!!!!! " "Blessings and Good Luck dear Friend!!!!! You ROCK!!!!!! Love ya!" "Cheering for a great cause and team Laura!" "I have seen many friends suffer from Leukemia and have also fought a hard battle to the end.! Hopefully, this will help find a cure to save the many that are fighting the disease. " "Thank you for your continuing devotion to this cause"
"You are an amzing woman! Hope this helps. Renee Lindsey"
"Lost a dear friend in 2018 and now what to support a new friend in her efforts to raise money for a cure! " "Keep up the fight Lacey!!!" "You got this girl! Go Team!! " "Have fun on race day! You got this, Laura. GO TEAM!" "Congrats on the race Laura, you are amazing! Thank you for all you do for LLS." "Hi Laura - thx for including me. Renee L."